U.S. equity index futures were lower this morning. S&P 500 futures were down 25 points in pre-opening trade. Futures are responding to new trade war fears with China. The Canadian Dollar added 0.05 to 78.43 following release of the Canadian March employment report. Consensus for employment was an increase of 20,000 versus a gain of 15,400 in February. Actual was 32,300. Consensus for the March Unemployment Rate was unchanged from February at 5.8%. Actual was 5.8%. Incyte dropped $18.37 to $64.70 and Merck fell $0.58 to $53.95 after their new drug to treat melanoma failed to reach a required end point during trials. Hasbro (HAS $85.40) is expected to open lower after MKM Partners lowered its target price to $96 from $110. 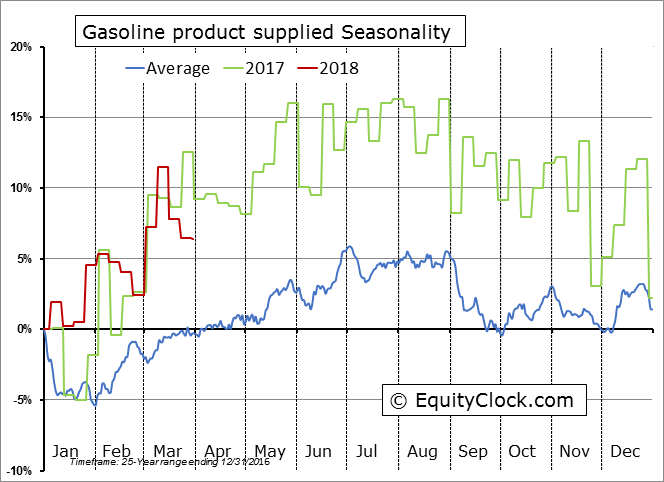 Note seasonality charts on Non-farm Payrolls, Initial Jobless Claims, Canadian Merchandise Exports and Canadian Merchandise Imports. 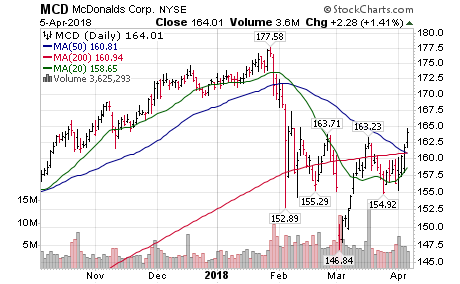 McDonalds $MCD, a Dow Jones Industrial stock moved above $163.23 completing a reverse Head & Shoulders pattern. 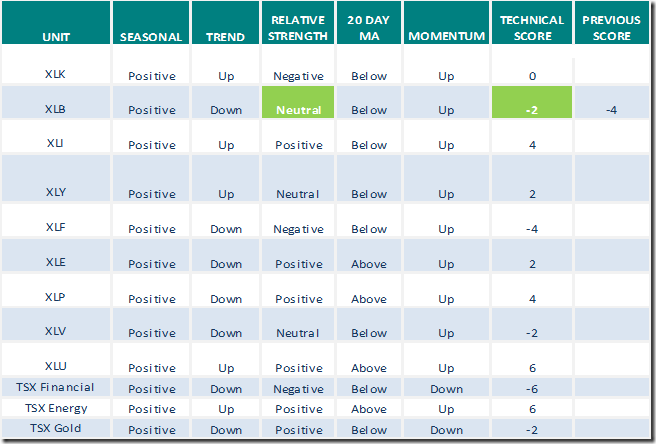 Technical action by S&P 500 stocks to 10:00: Quietly bullish. 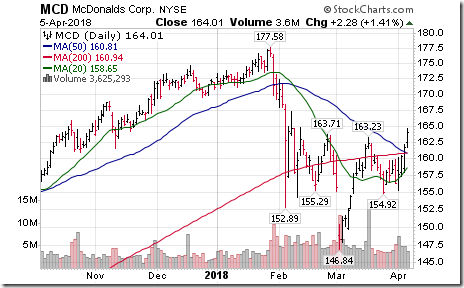 Intermediate breakdowns: $PHM $MCD. No breakdowns. 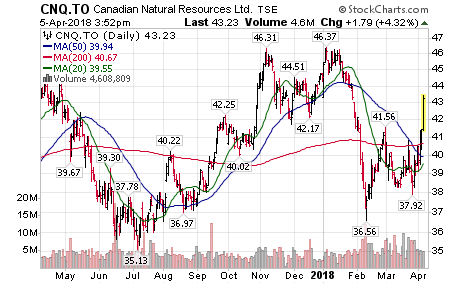 Canadian Natural Resources $CNQ.CA, a TSX 60 stock moved above $41.56 Cdn completing a double bottom pattern. 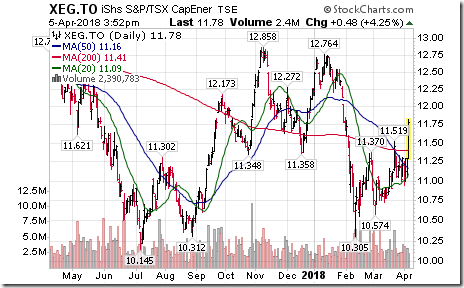 TSX Energy iShares $XEG.CA moved above $11.52 extending an intermediate uptrend. 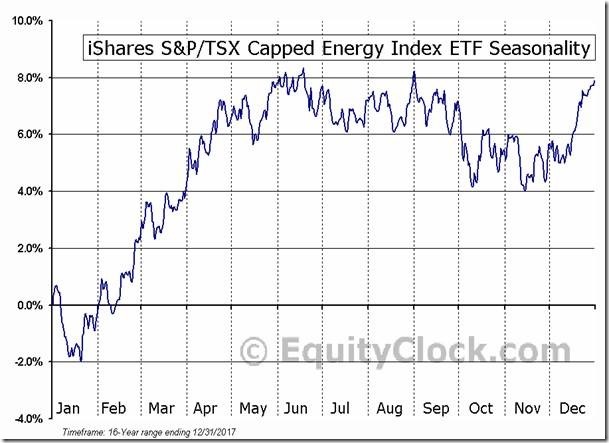 ‘Tis the season for the TSX Energy Index and related ETFs $XEG.CA to move higher to early June. 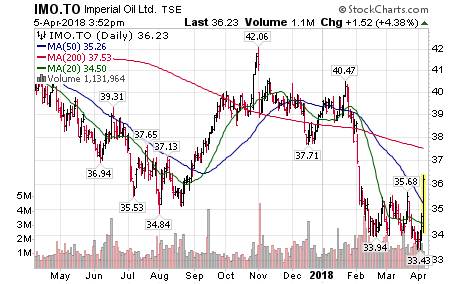 Imperial Oil $IMO.CA , a TSX 60 stock moved above $35.68 completing a double bottom pattern. 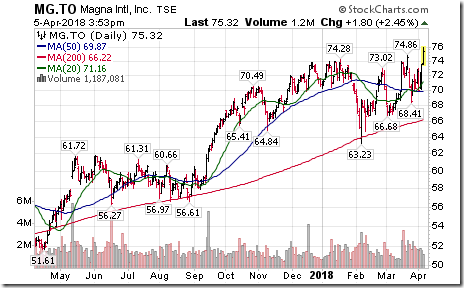 Magna Int’l $MG.CA $MGA moved above $74.86 Cdn to an all-time high extending an intermediate uptrend. Possible NAFTA breakthrough on autoparts. Another Cdn. 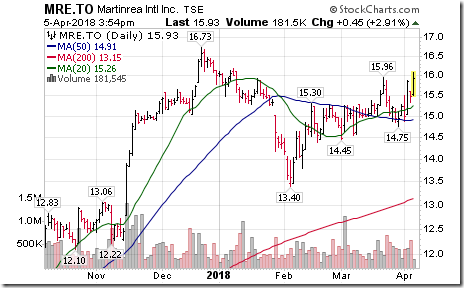 autoparts stock breaks out on NAFTA rumors! 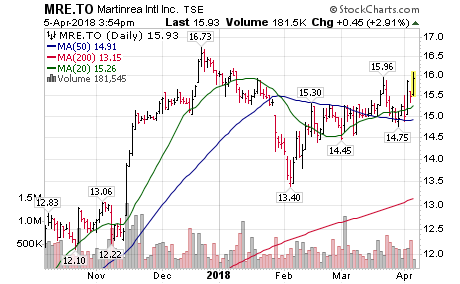 Martinrea $MRE.CA moved above $15.96 extending an intermediate uptrend. 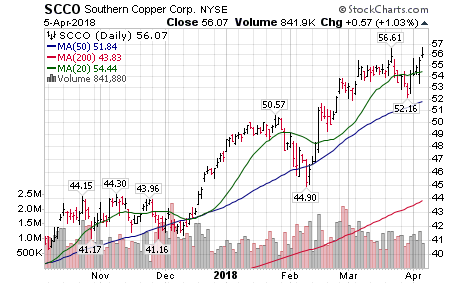 Southern Copper $SCCO moved above $56.61 to an all-time high extending an intermediate uptrend. 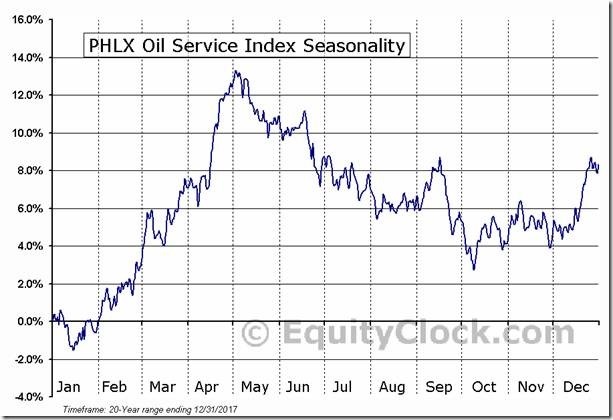 U.S. Oil Services stocks also popping! 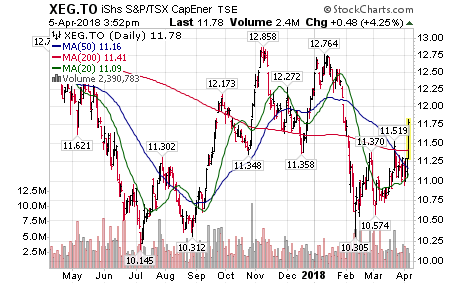 $DO $OIH $OSX $SLB. ‘Tis the season for strength! 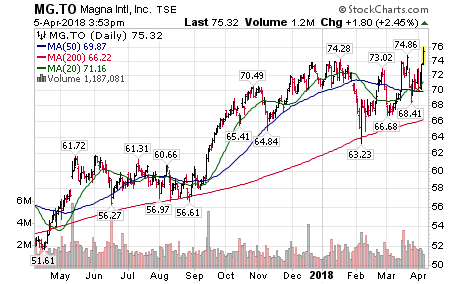 Rogers Communications $RCI $RCI.B.CA, a TSX 60 stock moved above $46.23 U.S. setting intermediate uptrend. 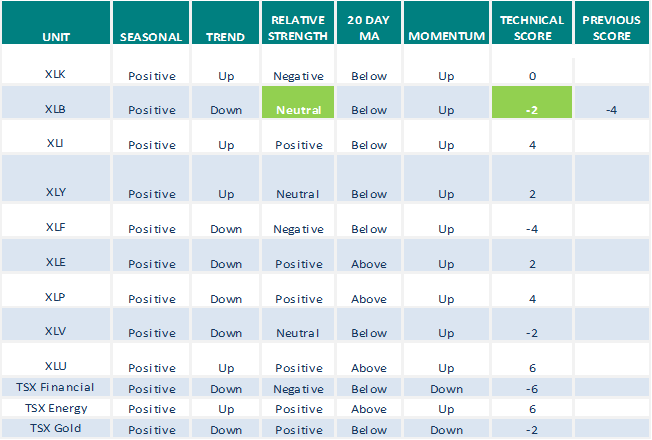 Energy stocks gaining respect today, but still a ways to go to account for strong product demand. 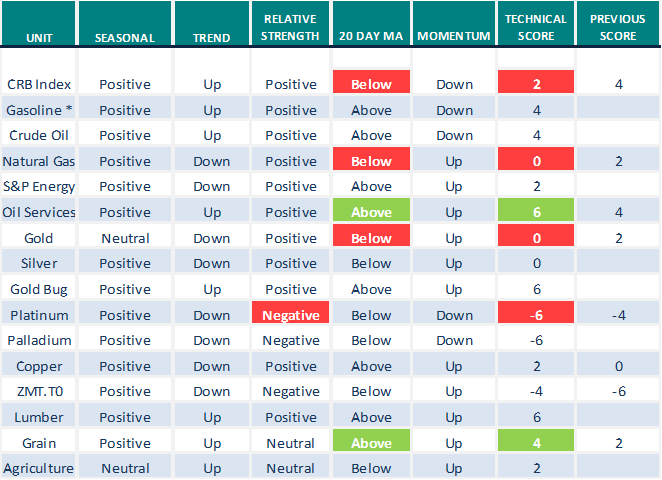 Reversal candlesticks on U.S. equity indices bounce from significant support, a strong buy signal. The Barometer gained 5.60 to 41.00 yesterday. 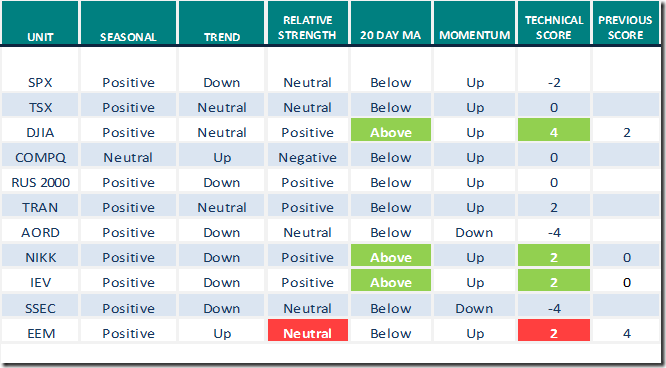 It has moved from intermediate oversold to intermediate neutral. The Barometer gained 8.43 to 47.93 yesterday. 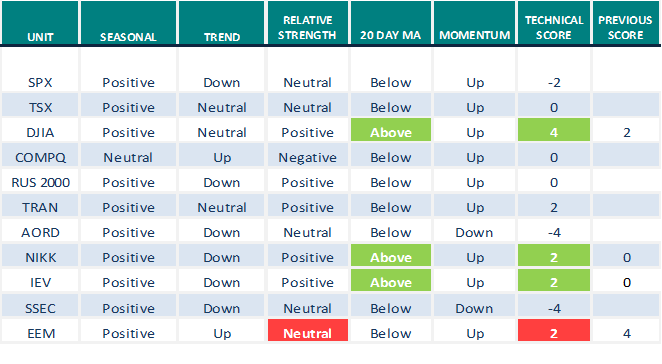 It changed from intermediate oversold to intermediate neutral. Here is the Dow. The chart pattern since the January high has formed a very clear Descending Triangle which is a bearish chart pattern. A break of the recent lows at 23400 would suggest a selloff of 3000 point or to the 20000 level. This low which is also at an uptrendline and at its 200ema MUST hold or you can expect a major selloff once again. 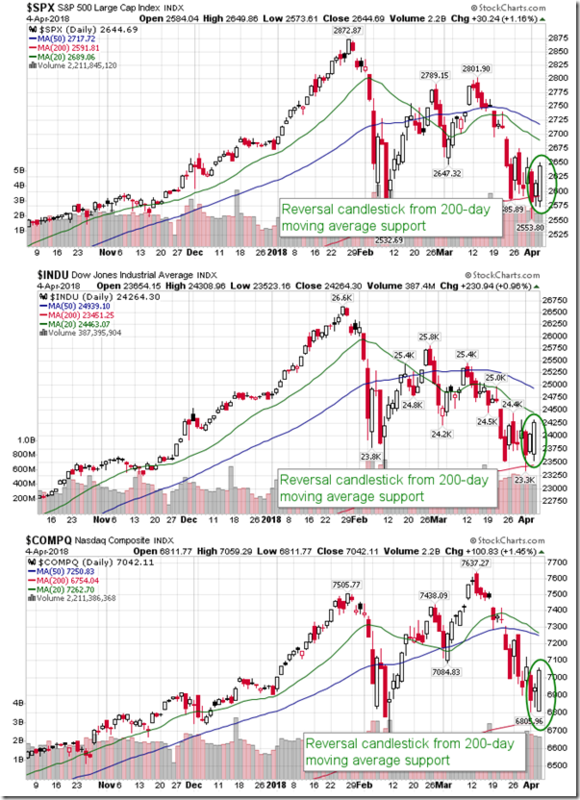 The chart ‘pattern’ suggests a breakdown but like all bearish chart patterns the break must come or it is just part of another pattern developing. Head and Shoulder patterns are like this as well and until the neckline breaks can’t be assumed to break. In fact this Descending Triangle and other bearish patterns like the Head and Shoulder patterns are very bullish if they fail to breakdown. 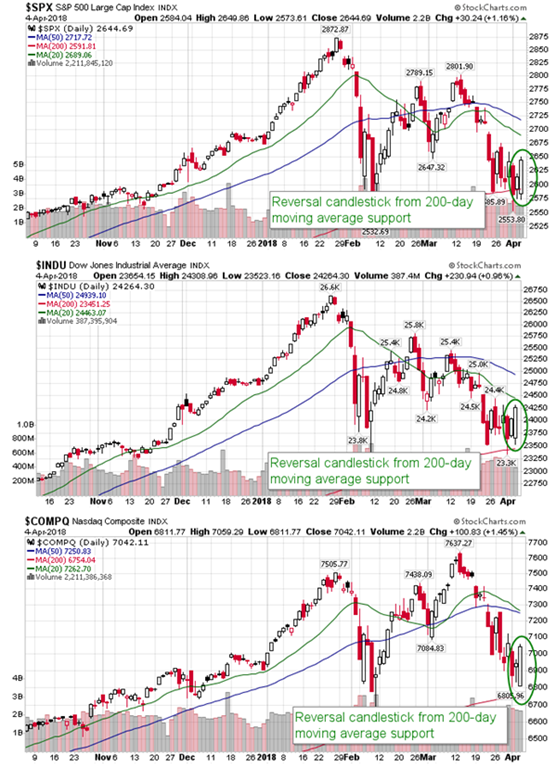 Bottom line is don’t “assume” anything but be aware of what the chart pattern is suggesting. 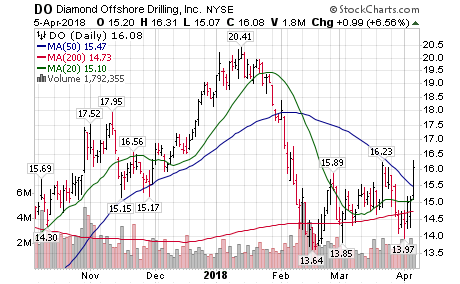 Watch the recent lows to hold or breakdown for direction. Price would need to break above the downtrendline to end this bearish Descending Triangle pattern with its bearish projections and suggest at least a sideways consolidation trend. 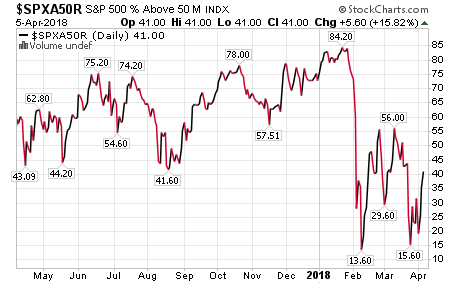 The same pattern is seen on the $SPX. Meanwhile notice the extreme ups and downs in the broad market whip sawing everyone’s positions. 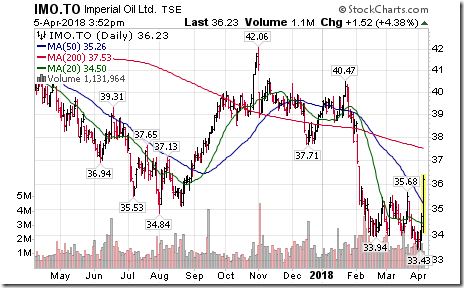 That type of price action is often seen at tops. Ron/BC: Hope you are doing well. Thanks to Ana my life is a bit exciting now. 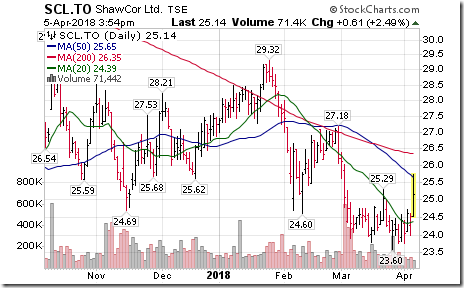 I watched the charts for few days and only started trading today. So far so good. Read the posts with interest from you, Bernie and all others so keep posting. Ana: Thank you! Look forward your views on S&P charts. I sold my SU.TO when it moved up so much so fast yesterday. 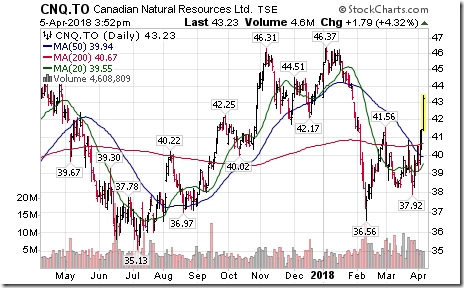 Can you share a chart of both US and Cdn? 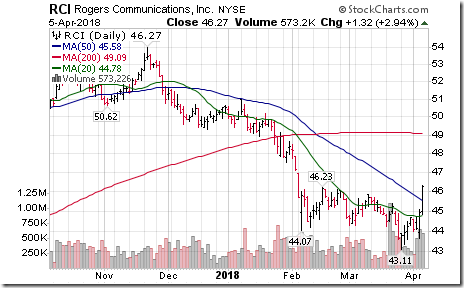 I am thinking of buying again at $44. What do u think is a good entry point? There was a discussion on TV about what of China stops buying Oil and gas from USA. They are the biggest buyers of USA oil. Production in USA increased by 33% last year . So if China stops buying as retaliation it could affect prices in Asia to Middle East. 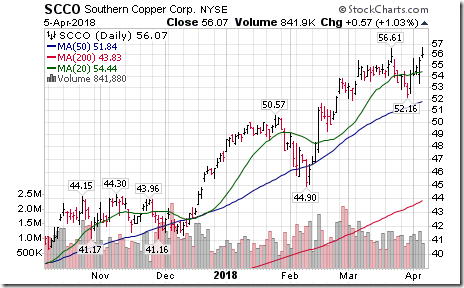 Trump Is Wrecking The Market – Hopefully some agreement will be made with the Chinese to have some kind of negotiation with trade representatives. This all makes political sense with the mid-terms coming in November. If Trump succeeds in getting the Chinese to sit down with the idea of creating a more level playing field for the US and others it will help the Republican Party a lot. When this starts to happen we could see great things happen for the US equity market. In the meantime it is feeling quite painful. Buyers at end of day saved the day but not out of woods. 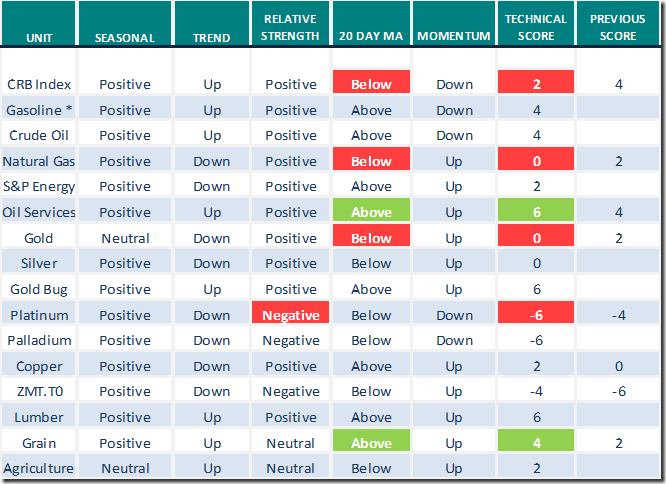 S&P500 for last several days has been trading near 200-day moving average technical level . 2,594 was back in play as major support. 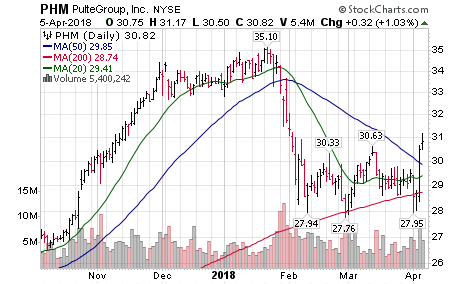 SU on the NYSE has solid support at $32 and I wouldn’t chase it up here now. 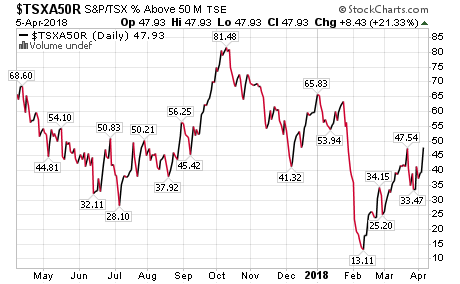 SU.to on the $TSX has support at $44-$44.50. Those are the levels to buy in my opinion. 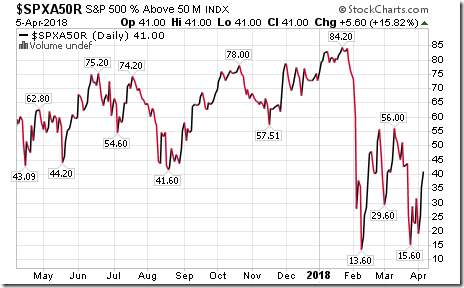 As far as exciting intraday chart trading goes Kam had good solid advise and a warning to beginners trying to trade volatile markets that are VIX related. You have to be able to take losses often and quickly to stay in that game. Not something you can learn to do well in a few days or reading a few comments. There are courses you can take for short term trading that are well worth the money. 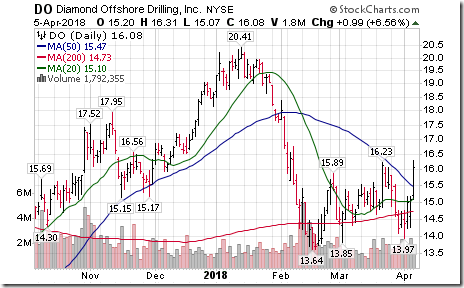 I took one years ago from a guy in Florida using a live charting service and Pal Talk where you can listen to and speak to your teacher as well as see how he is trading and getting in and out of a position. Well worth the $500 U.S. But most important of all it taught you never to freeze and watch your position move against you. Learning how to take multiple losses and not get rattled by it is important to learn and be realistic in your expectations. And you learn a lot about yourself and your temperament. You’d be amazed what you can learn about yourself with short term trading. AHA!! I think that you are referring to Fast Eddie, the trader from Miami. While I was down in Charlotte, I met a trader who used to trade with the “pit bull”. Marty Schwartz. His first question – “What the f… are you doing up in Canada?” HA!!!! Schwartz mostly trades currencies now. Do you remember Dr Marty? I met him in 2007. He ended up trading currencies after years of trading comms. Currencies seem to be the new game that the big dix are playing these days. Yes Eddie Curvo.Remember him and Sherri? Those were a pair! I recall DR.Marty. I bought a report of his long ago. He was a very wise man and I was sad to see him pass away. Not surprised he moved on to currencies as that’s what it’s all about. 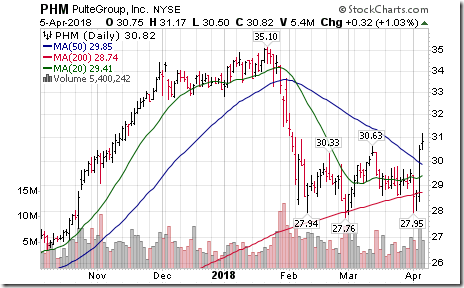 I was talking to Questrade Friday and told them if they want to make some serious money to drop their currency exchange fees down to .50% like TDWaterhouse used to charge rather than around 2%. I told him they were not competitive and they’d make far more money on clients switching currencies back and forth than buying and selling stocks for next to nothing. He said he’d tell the ‘team’ about the idea as they do value input from their customers and do implement good ideas. So we’ll see. I recall Swartz on the Wall Street Week program as he was a big fish for sure. If you get time email me the name of the place you register for house sitting,thanks. We have a house sit in Ottawa for 6 weeks from mid August to Oct 1. Old clients of ours who called us first to see if we were interested. No animals to take care of. Just someone to live in the house. They are planning a bike tour through Croatia. We have been asked if we want to return to Charlotte next year by the home owners. We are working on a hs in New Zealand for the coming winter. We had scheduled a regular circuit a few years ago. You can time your house sits to match the time you want to travel. Friends of ours schedule theirs through Arizona and New Mexico in the winters. Let me know through email if you have any questions. Kudos about the QT suggestion. Yes, they do implement good ideas. Hope that they follow up on this – I do a lot of US trades…. Good suggestion you made to QT! I don’t use them but like many of their features like no commissions on ETF purchases. I’m puzzled why they don’t offer the same for mutual funds. 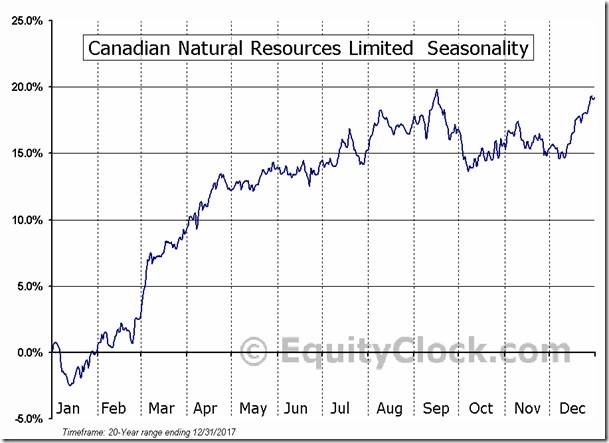 I believe they’re the only Canadian discount broker who charge commissions on mutual fund trades. That’s a big deterrent for Mawer fans like me. 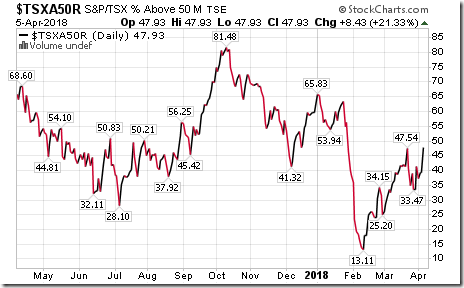 Did Kinder Morgan just throw in the towel or am I reading it wrong? Well I’ll phone them tomorrow and ask for an explanation why they charge commissions for Mutual Funds. I believe they can buy and sell any and all Mutual Funds but cant recall the rest of the story. I’ll find out tomorrow. I’ll also ask him what if anything his “team” had to say about low currency exchange fees. Perhaps I’ll tell them I might switch my RIF cash to TDWaterhouse for better exchange fees as I used to do that all the time. I could switch $100K for $500. Not hard to make money on a small move in the CD$. Can’t do it anymore. I’ll let you know how my “fact finding mission” goes. 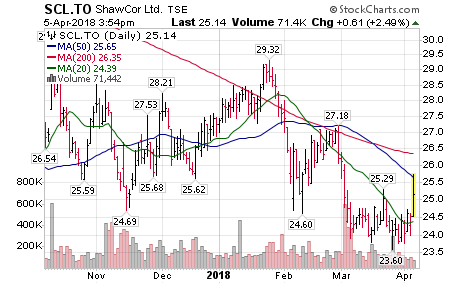 I’ve been looking at the Mawer chart and while it looks good when rising there are long flat periods on the chart that would drive me crazy. 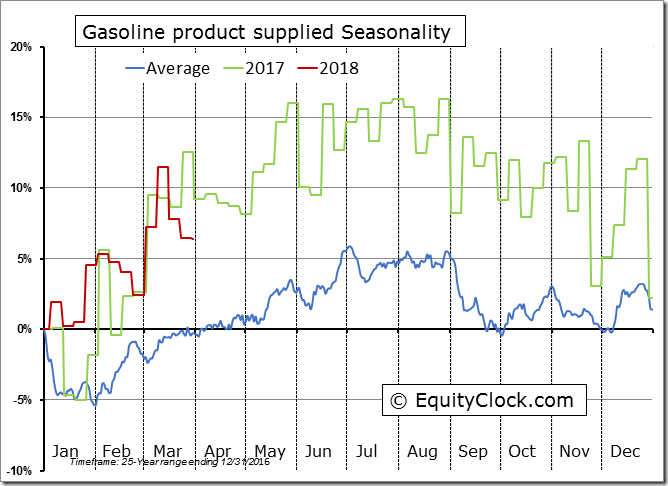 I just heard this economic expansion is the 2nd longest in history and all the sign posts are in place for a major top into fall and a major bear market starting in the fall right through 2019. Tough to make a commitment with those type of charts and comments.